A teenager has been charged with two counts of grievous bodily harm with intent after two teenage boys were stabbed in Sussex on Wednesday. The 16-year-old boy, who cannot be named for legal reasons, has also been charged with attempted grievous bodily harm, police said. 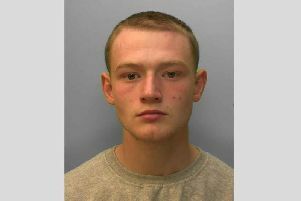 He was due to appear at Brighton Magistrates’ Court today. A 17-year-old boy and a 16-year-old boy suffered serious injuries after they were stabbed in Littlehampton, West Sussex. Read our original story here. They both remain in a stable condition at the Royal Sussex County Hospital in Brighton, police said. A third victim, a 16-year-old boy, suffered minor injuries as part of the same incident. The four teenagers involved are believed to be known to each other and police are continuing with their enquiries, a spokesman added. Shoppers were left ‘shocked and panicked’ by the incident on Wednesday. Read our story here.